Excellent game at Mombo has made this area Botswana's top wildlife documentary location. Little Mombo is built on the same island as Mombo and is an extension of the main camp. Although Little Mombo has only 3 rooms, it can be 'enlarged' for larger groups by booking out some of the rooms from the main camp. Located just off the north western tip of Chiefs Island, is the secret paradise of Mombo. 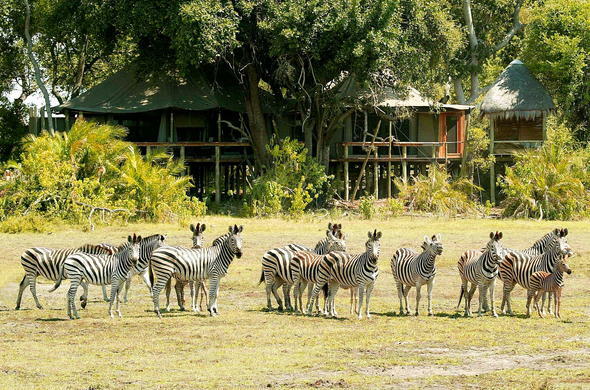 Mombo Camp is situated deep within the Moremi Game Reserve, which boasts large numbers of wildlife. Little Mombo Camp provides one of the highest quality wildlife viewing opportunities in Africa. Giant Umbrella Thorns and Ilala palms dot the expansive plains to create a superb savanna landscape alongside the marshes and floodplains of the Delta. Solitude for guests is ensured, as you have exclusive use of this area for Mombo and your trail camps. Apart from the sporadic government official or wildlife filmmaker, the staff and other guests are the only other people you will see during your stay. The camp has a total of 12 guest rooms divided into 2 distinct and independent camps. Mombo has 9 rooms and Little Mombo has 3 rooms. Each tented room is raised off the ground offering great views over the plains. The new rooms have a tented camp feel, but are luxuriously appointed. The bathrooms are en-suite, including indoor and outdoor showers. The main living area is under thatch and canvas. There are pools at both camps. Raised walkways link bedrooms to the living area. A large pack of Wild Dogs frequent the area around the camp and have been successful in raising large litters in recent years. The excellent game at Mombo Camp has made this area Botswana's top wildlife documentary location. National Geographic, BBC and many others have been filming here. Birdlife is prolific with waterfowl and waders being particularly common. Dickinson's Kestrel, Pinkthroated Longclaw, Black Coucal, (summer months), Wattled Crane and Meyer's Parrot are among the species found on the floodplains and in the woodlands. Mombo Camp is located in the unspoilt northern Okavango Delta. The Okavango Delta is a 6000 sq mile maze of lagoons, channels, and islands.